Mark Kirk To Be Given Equality Illinois "Freedom Award"
As the issue of equal rights continues to (unfortunately) divide some in the Republican Party, there have been a few, vocal, leaders who have consistently been a voice for serving all the voters in Illinois. 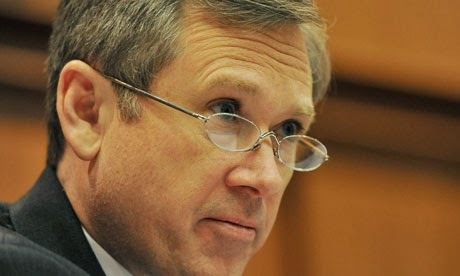 Senator Mark Kirk is being honored this weekend for his commitment to equal rights and non-discrimination. When you really think about it, what is more important to our country than equal rights and non-discrimination? Shouldn't those be two issues that all politicians - and all Republicans - want to agree on for Americans and for Illinoisians? Unfortunately for us here at the Truth Team, some in our party don't agree with us. But, with Mark Kirk and folks like Judy Baar Topinka, Tom Cross, Ron Sandack, Ed Sullivan leading the way, we as a party won't die. Republicans wont' fade away. They won't let us. They want to keep the party flexible and bring in more people than we turn away. Republican U.S. Sen. Mark Kirk of Illinois will be honored with the Equality Illinois Freedom Award at the LGBT organization’s annual gala on Feb. 8 at the Hilton Chicago, 720 S. Michigan Ave.
A recently retired Navy Reserve commander, North Shore congressman since 2000, and the state’s junior senator since 2010, Kirk will be honored for his contributions towards the betterment of lesbian, gay, bisexual and transgender lives. Equality Illinois executive Bernard Cherkasov calls Kirk a leader when it comes to the fight for LGBT equality. ...Equality Illinois says Kirk has been an important voice in favor of the transgender-inclusive Employment Non-Discrimination Act—passed by the Senate but now stalled in the House of Representatives. As the co-sponsor of the bill, Kirk made his first Senate floor speech since his return to argue for the passage of ENDA. “I think it’s particularly appropriate for an Illinois Republican to speak on behalf of this measure in the true tradition of Everett McKinley Dirsken and Abraham Lincoln, men who gave us the 1964 Civil Rights Act and the 13th Amendment to the Constitution,” he declared. Most recently, Kirk refused permission for an anti-LGBT group to use a Senate meeting room. “Sen. Kirk doesn’t affiliate with groups that discriminate,” his office said. We are proud to call ourselves Republicans here at the Illinois Truth Team. It is because of folks like Mark Kirk that we're hopeful that we can grow the party and help change Illinois.